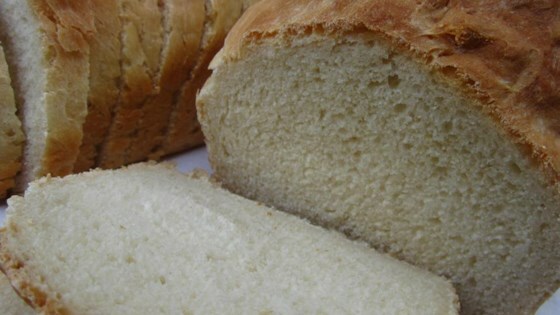 "A perfectly simple and perfectly good white bread." In a small saucepan, heat milk until it bubbles. Remove from heat and add the sugar, salt and shortening. Cool to lukewarm. While milk mixture is cooling, dissolve yeast in warm water and let stand until creamy. Combine cooled milk mixture with yeast and water in a large mixing bowl. Stir in 2 cups of the flour, then add the remaining flour, 1/2 cup at a time, to make a moderately stiff dough. Knead on a lightly floured surface for 8 to 10 minutes, or until smooth and elastic. Place the dough in a lightly oiled bowl and turn to coat the dough. Cover the bowl with a damp towel and let rise in a warm place until the dough has doubled in volume (about 1 1/4 hours). Lightly grease two 9x5 inch loaf pans. Punch down the dough and turn it out onto a lightly floured surface. Shape into 2 balls, cover and let rest 10 minutes. Shape dough into 2 loaves and place in pans; let rise until doubled (about 1 hour). Preheat oven to 400 degrees F (200 degrees C). Bake in the preheated oven for 35 minutes or until the top is golden and the loaf sounds hollow when tapped on the bottom. Simply amazing! I cooked the loafs for 35 minutes at 375 degrees. The recipe doesn't need to be changed at all, perfect the way it is! There's only one problem with this bread I can't stop eating it ! Great recipe thanks.